You'll be £18.00 closer to your next £10.00 credit when you purchase Fighting the Great War at Sea. What's this? The overriding image of the First World War is the bloody stalemate of the Western Front, but although much of the action did occur on land, the overall shape of the war – even the inevitability of British participation – arose out of its maritime character. It was essentially a struggle about access to worldwide resources, most clearly seen in the desperate German attempts to deal with the American industrial threat, which ultimately levered the United States into the war, and thus a consequence of British sea control. This radical new book concentrates on the way in which each side tried to use or deny the sea to the other, and in so doing it describes rapid wartime changes not only in ship and weapon technology but also in the way naval warfare was envisaged and fought. Combat produced many surprises: some, like the impact of the mine and torpedo, are familiar, but this book also brings to light many previously unexplored subjects, like creative new tactical practices and improved command and control. The contrast between expectation and reality had enormous consequences not only for the course of the war but also for the way navies developed afterwards. This book melds strategic, technical, and tactical aspects to reveal the First World War from a fresh perspective, but also demonstrates how its perceived lessons dominated the way navies prepared for the Second. Friedman takes a fresh look at the ways each side tried to gain command of the sea in what proved to be a four-year campaign. He describes the rapid wartime changes in ship and weapon technology: mines, torpedoes and aircraft - and in the way naval warfare was fought, the tactical practices and changes to command and control. As with many of Friedman's books, the extensive and informative captions to the many well-chosen photos are essential reading, along with the main narrative. This book is highly recommended. ... By bridging the gap between warhsip design and strategy, Friedman underlines the importance of operational realities to writing military and naval history. This is a valuable contribution in itself. A testament to Norman Friedman's deep knowledge of the naval side of the First World War. Norman Friedman's Fighting the Great War at Sea is a lavishly produced book from Seaforth, getting the entire naval story of the Great War into a single volume and making it read well is not [easy] and Norman Friedman has done a fine job. This impressively large book provides a detailed and well-illustrated account of the war at sea during 1914 to 1918. This new book concentrates on the way in which each side tried to use or deny the sea to the other, and describes rapid wartime changes, not only in ship and weapon technology, but also in the way naval warfare was envisaged and fought. The impact of new inventions, such as the mine and torpedo, is discussed, but this book also brings to light many previously unexplored subjects, such as creative new tactical practices and improved command control. Strategic, technical and tactical aspects are all discussed to show World War I from a fresh perspective, while also looking at how the lessons learned dominated the way navies prepared for the next war. Despite its expense, this thoroughly researched and well-produced book is a must for anyone with an interest in World War I warships and the development of naval technology. Dr Friedman brings together technical, and tactical aspects of the First World War and demonstrates how its lessons dominated the way navies prepared for the Second World War. Contains a valuable list of resources, more than 40 pages of chapter notes and a wealth of illustrations. ... This reviewer learnt a great deal from the book. Recommended. Friedman's book is fair and balanced and provides an excellent analysis of the entire war at sea... One of Friedman's finest works and a 'must have' for any naval enthusiast. This is probably the most interesting and informative warship book that I have read in the last 12 months and consequently is very highly recommended. Packed with detail...written in such fully-rounded prose and with fleshed-out context that it draws anyone in who is curious to look at the whole board. For anyone looking for a serious and in-depth account, lavishly illustrated and copiously referenced, it may well be indispensable. Norman Friedman has the remarkable ability to explain how technology, geography and the lessons thought to have been learned from the Russo-Japanese War influenced Navies in different ways. This thought-provoking book can genuinely be said to give the reader a fresh perspective and greater understanding of the conflict than any previous work... This outstanding book connects and makes sense of all the strands that affected naval warfare a century ago. Coinciding with the centenary of the Great War this sumptuously produced book with a foreword by the First Sea Lord serves as an excellent introduction to any study of the war at sea during the global conflict. An excellent book, well-illustrated and beautifully produced by Seaforth to their usual high standard, most strongly recommended. [Norman Friedman] writes in a lucid and eminently readable style as well as communicating his wealth of research and deep knowledge of his subject. A treasure trove of monochrome archive photographs of the ships, battle formations, actions and the damage the ships sustained in battle also punctuates this definitive work. 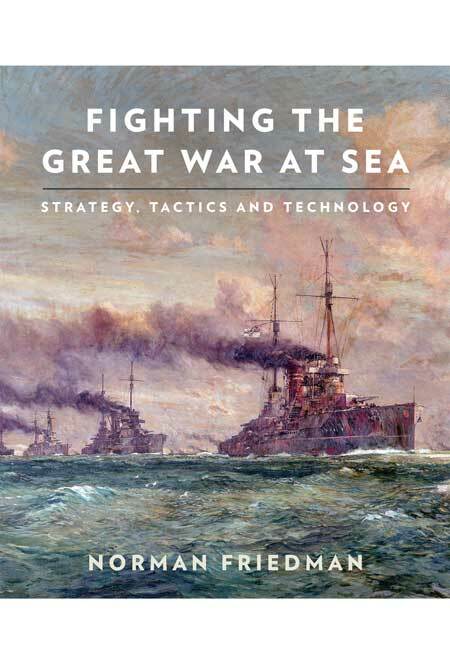 A fascinating and very informative large, comprehensive and superbly produced volume on the subject of naval warfare at seat during the Great War, particularly seen from the viewpoint of its major European protagonists. This new book is a typical work of Friedman, based on massive research in original sources and a deep understanding of the relationship between technology to tactics and strategy...Lavishly illustrated with excellent and well produced photographs...Complemented by extensive, excellent, informative and well-informed captions...The author is admirably prolific and an example to us all in hard work and productivity...Required reading for anyone interested in the maritime warfare of the 20th century...A compelling and convincing historical analysis of World War 1. Norman Friedman is a master of the evolution of naval strategy, tactics and technology. He has the ability to lead the reader along the pathways that influenced decision making and national policy during World War I. 'Fighting the Great War at Sea' is a rewarding read that will leave many wanting to return again and again just to see what they might have missed the first time. A typical product of Seaforth of Barnsley, lavishly illustrated with excellent and well-produced photographs, some well known but others less so. All however are complemented by extensive, excellent, informative and well-informed captions. The overall quality of the book and its contents make it required reading for anyone interested in the maritime warfare of the 20th Century. Fighting the Great War at Sea will delight anyone who is interested in naval history.